Microbes got their name because they’re really small. The term refers to living things so small, in fact, that they cannot be seen with the naked eye. They may be algae, animals, fungi, bacteria, or one of several other categories of tiny life forms that can only be seen with the help of a microscope. Most microbes are unicellular (single-celled) organisms, and though an individual can't be seen without aid, microbes often cluster in large numbers, forming colonies and communities that are clearly visible if you know how to look. The vast majority of microbes need water to survive and grow, so to spot them, it’s best to look in damp places. Color is very important. 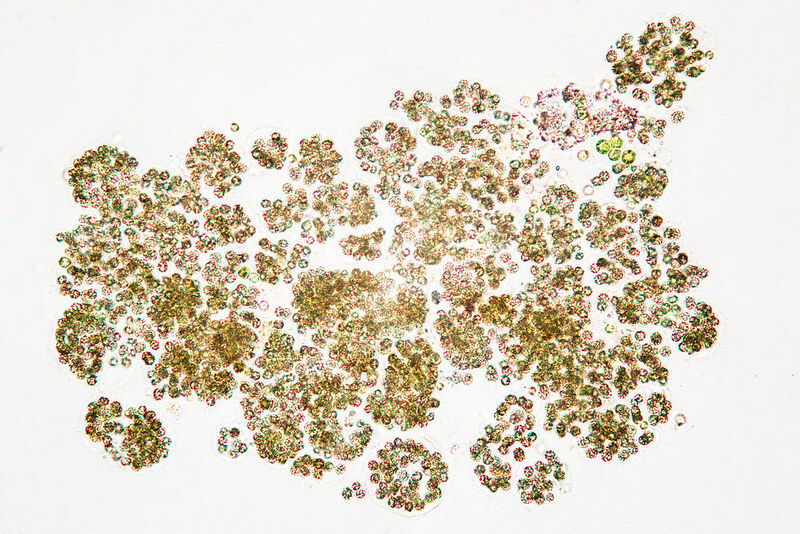 Microbes come in greens and browns and reds and whites. If you see a body of water that is opaque and tinted, chances are it’s full of microbes. Look for these signs of microbial live at Brooklyn Botanic Garden and beyond. 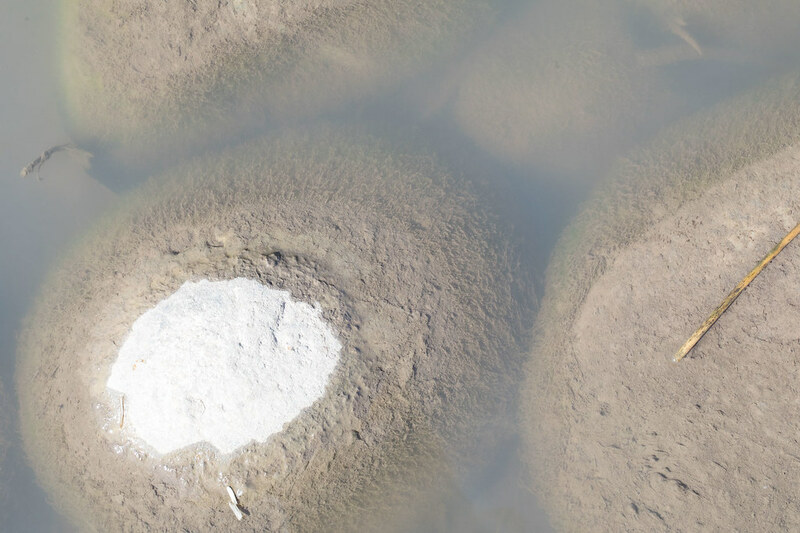 In some ponds and lakes you can even see individual microbial colonies floating freely. This picture shows a jar containing water from BBG's Japanese Hill-and-Pond Garden. 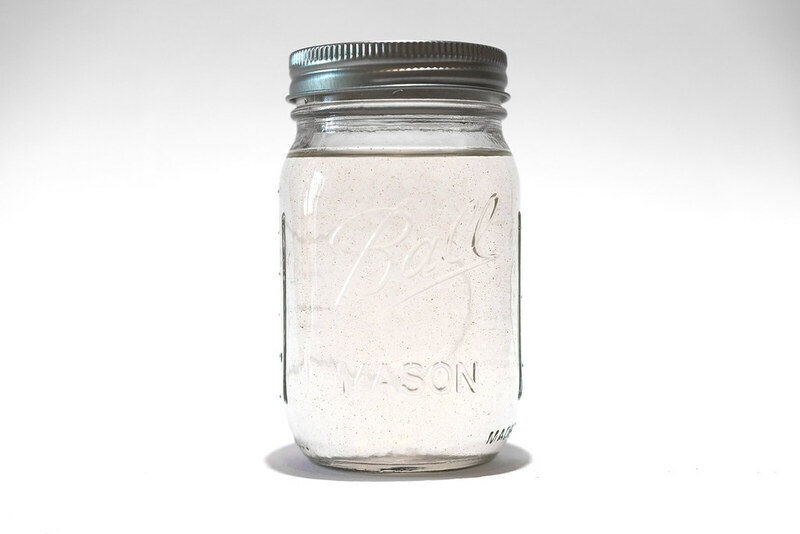 Look closely at the jar—can you see tiny floating particles? Each of these thousands of particles is a colony of microscopic bacteria called cyanobacteria. If we put the colonies under the microscope, we can see the individual cells that form the colonies. Not all microbes are able to float or swim. Some need some kind of surface to live on, just like we do. Surfaces underwater are hotbeds of microbial diversity. 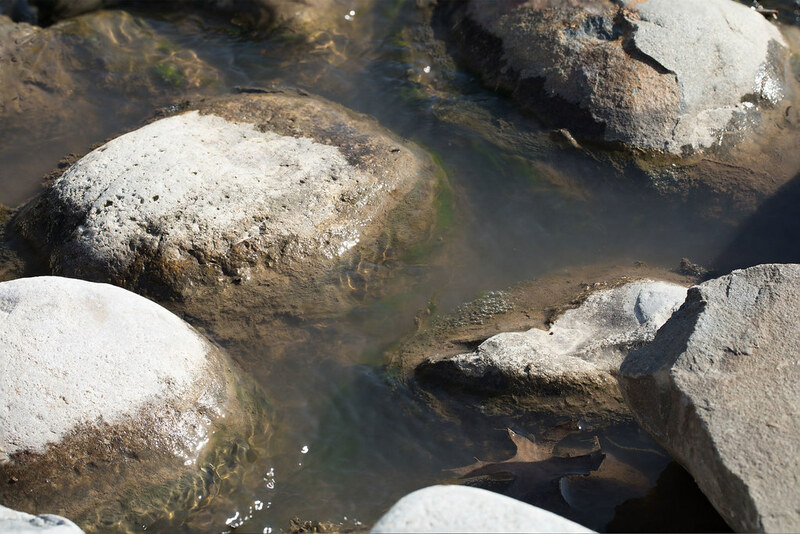 For example, the submerged rocks in the Shelby White and Leon Levy Water Garden are covered with a slick brown coating. This coating is teeming with microbes. The slimy substance forms when many unicellular algae, called diatoms, grow together into large communities. Some of the diatoms form long filaments with cells stacked end to end. When many of these filaments cluster together, they form the fine brown threads you can see dangling off the rocks. Visit the Pondlife multimedia exhibition in the gallery of the Steinhardt Conservatory. As they grow, these organisms extrude a slimy mucilage around themselves as protection from predators and desiccation. Each individual cell only excretes a small amount, but the mass effect is clearly visible. This mucilaginous layer provides a healthy habitat for many other microbes, as well as animals like fish and small invertebrates. For them, these algae lawns are important sources of food and shelter. Other signs of microbes can be seen on the rocks in the Water Garden too. Do you see the small path of bubbles in the photo here? The bubbles are the products of microbial photosynthesis. Just like land plants, algae live off sunlight. Through photosynthesis, the algae use the energy in sunlight to make sugar molecules. A byproduct of this process is oxygen, which gets released back into the water. Excess oxygen will gather and form a bubble, eventually getting large enough to rise back to the surface. When you see many tiny submerged bubbles like this, you know there are algae here, hard at work. Microbial communities come in many different forms. 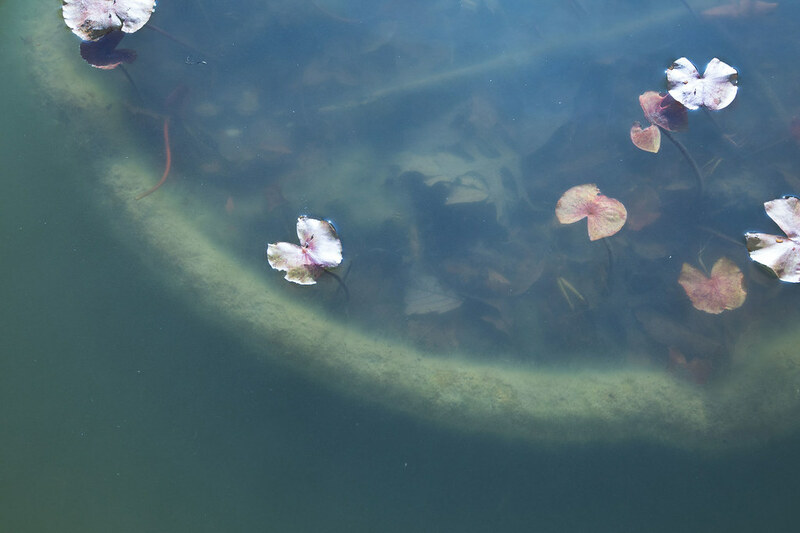 The submerged surfaces in the ponds of Lily Pool Terrace are also covered in microbial communities. The planters have been colonized by a filamentous green algae, which in turn has been colonized by many other microbes seeking a place to live or something to eat. Water isn’t the only place to look for microbes. They also live on land, and even on many rocks and man-made surfaces. Next time you’re walking down the street, take a look at the walls and pavements around you for microbial colors—greens, browns, reds, and whites—covering a surface. These tiny communities have proliferated by making use of some kind of resource—perhaps a leaky pipe or some excess nutrients from waste. 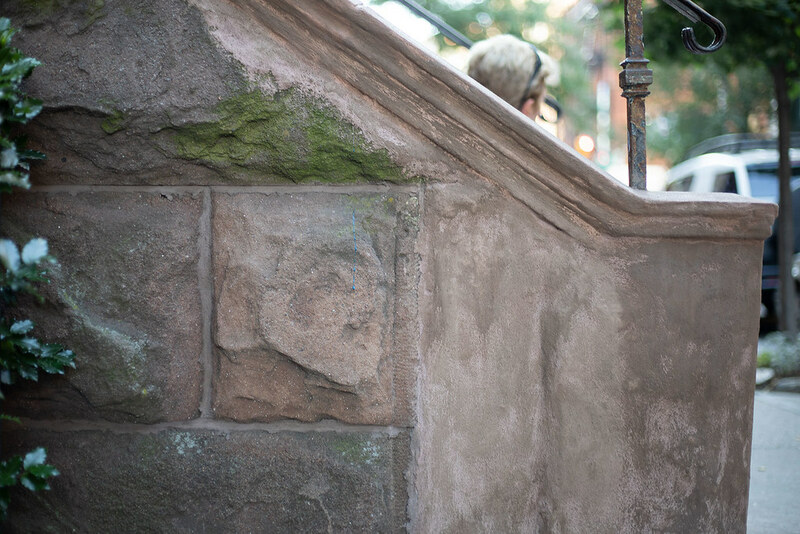 The picture here shows a community of green algae living on an obliging brownstone wall. Each patch of color is a thriving microbial community living right under our noses. Water sample from the Japanese Hill-and-Pond Garden. Photo by Sally Warring. 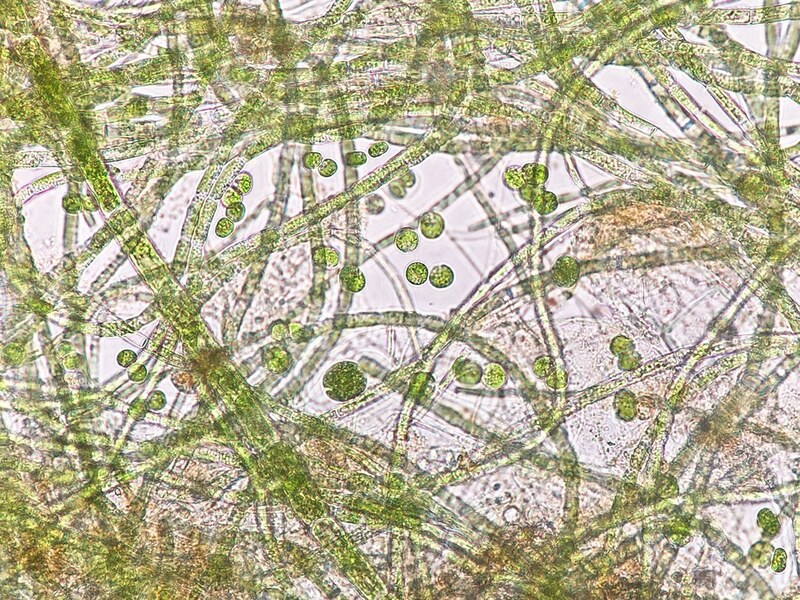 One of the cyanobacteria colonies from the Japanese-Hill and Pond Garden, magnified 400x. Each brown dot is an individual, together many individuals make up the visible colony. Photo by Sally Warring. Diatom lawn. Photo by Sally Warring. 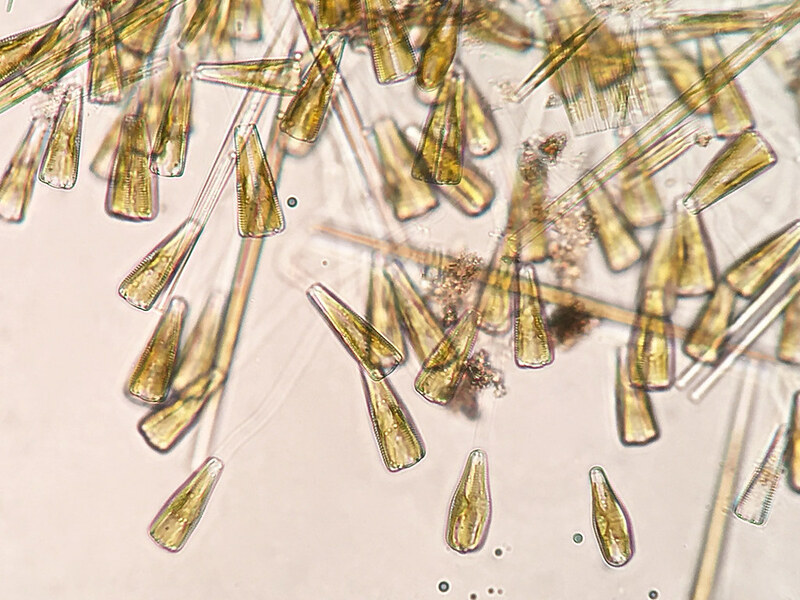 Diatoms from a diatom lawn, magnified 400x. Here you can see individual diatom cells, many of which are attached to the end of a mucilage stalk. When thousands of cells grow together covering the rock surface, they form a visible layer with many trailing strands. Photo by Sally Warring. Oxygen bubbles. Photo by Sally Warring. Algal lawn. Photo by Sally Warring. 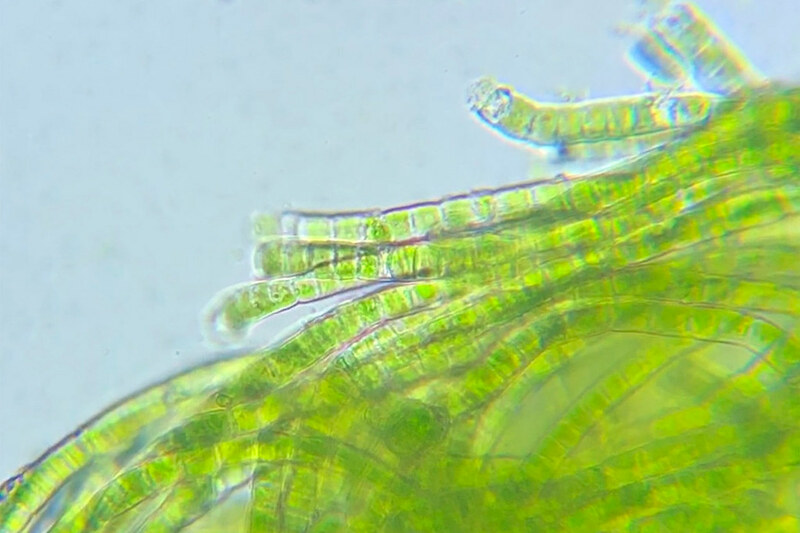 An example of filamentous green algae growing together in a mass. Each filament is one cell thick. This mass ends up completely coating a submerged surface. Photo by Sally Warring. Street Pondlife. Photo by Sally Warring. The algae growing on the wall are also filamentous greens. By growing together in a mass the group can soak up water and share resources, allowing them to maintain an active community. Photo by Sally Warring.